To promote her tv series 'The Cry', Jenna Coleman attended the photocall yesterday(October 16th) during the 2018 Cannes MIPCOM in Cannes, France. 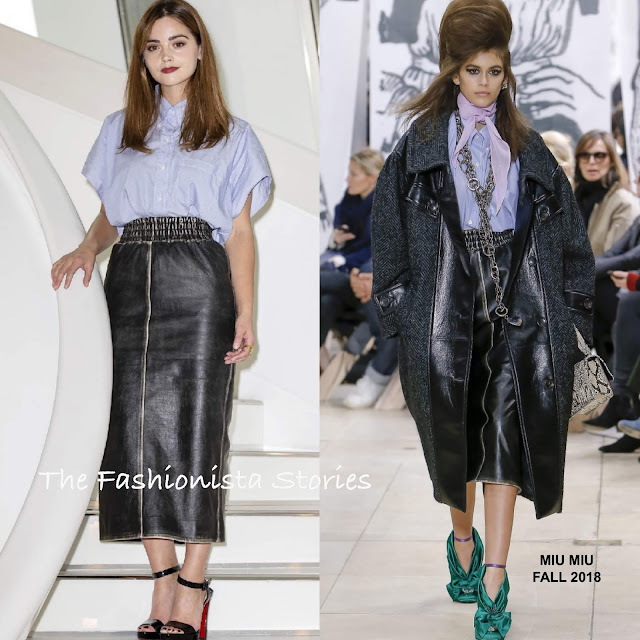 Jenna posed in a blue wide short sleeve, button down shirt and a black gathered waist, calf length leather skirt from the MIU MIU FALL 2018 collection. Her simple but chic look worked for the casual photocell. A pop of color came via her lop which topped off her look along with center part tresses and CHRISTIAN LOUBOUTIN black sandals.